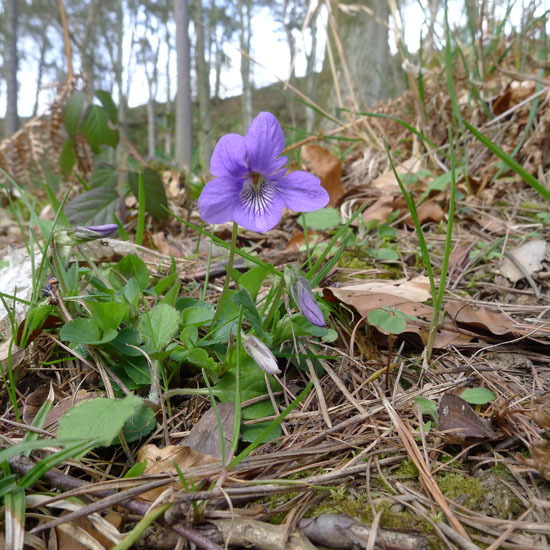 Common Dog-violet, Viola riviniana: Spring herbage. Common Dog-violet, Viola riviniana, flowers. Photo: Paul Kirtley. Common Dog-violet, Viola riviniana, is the most common violet in the UK and provides some useful herbage for a wild salad, particularly in the spring. It flowers March to May and is then easy to spot but a little less so at other times. The leaves and flowers are edible. The leaves are fairly bland, having a pleasant flavour with only a little bitterness, if any, making it a wild food worth picking up as you forage. 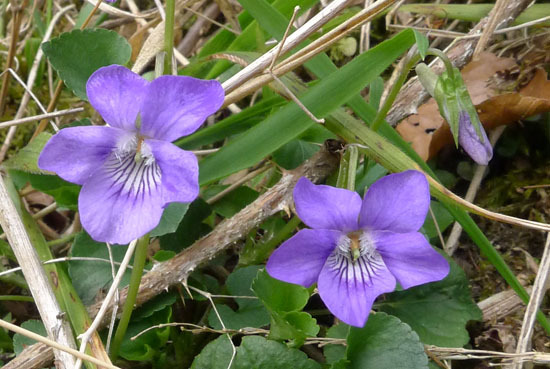 The leaves of most violets have quite a lot in common. But before we get into a tailspin about differentiating between similar violets, we should remember what Professor Gordon Hillman writes in Wild Food “The leaves and flowers of all members of the violet family seem to be edible”. 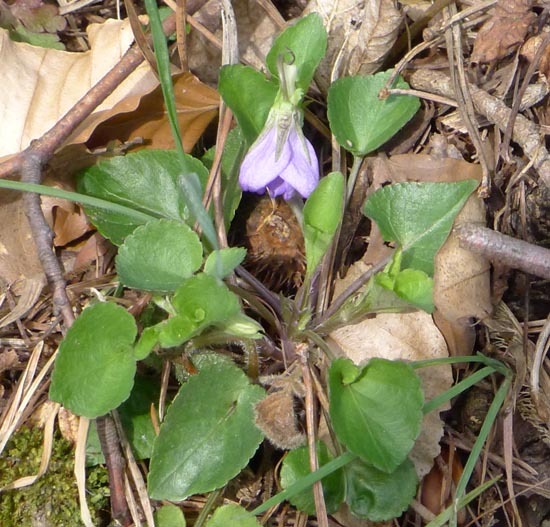 Common Dog-violet, Viola riviniana, leaf rosette. Photo: Paul Kirtley. The leaves of the common dog-violet are heart-shaped, smooth, almost without hairs and with regularly-spaced indentations around the edges. The flowers are an attractive blue-violet with five petals. The lower petal or lip has prominent veins. The flower’s sepals are pointed. 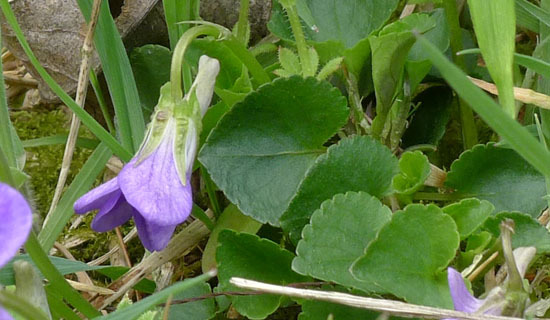 All violets in the British Isles have a spur which sticks out behind the flower; one of the key identification features of V. riviniana is that its spur is lighter in colour than the petals and is notched at the tip. Flower and leaf detail of Common Dog-violet, Viola riviniana. Smooth heart-shaped leaves with shallow indentations. The flower on the left is not fully open yet and you can see its spur protruding backwards; it is lighter than the petals and notched at the end. Photo: Paul Kirtley. Remember to take only a few leaves from any particular plant so as not to damage it too much. Please read the BSBI’s Code of Conduct for the Conservation and Enjoyment of Wild Plants for guidance on the best practice and the law. patches of the plant. Always pick in moderation so that plenty is left for others to enjoy. Photo: Paul Kirtley. Hello Paul,great article , i enjoyed some of these the other week with some Salami whilst resting after a long walk.There are plenty around by me so i will probably gather some more on another outing. Thanks Darren, good to hear you enjoyed the article. And the violets – a delicious combination with the salami. Ate my first violet (and flower) yesterday. Decent taste actually, good to add some diversity. Nice articles. Planning a short walk this weekend to see what I can find and taste! Hi Joep. Enjoy your walk and your weekend. I hope the weather over there is as good as it is over here. Let us know if you find anything interesting. Another Interesting Piece Thanks Paul for taking the time to write about this subject. when ever I try a foraged edible I find it a taste that has to be learnt, do you think that with our modern sweetened pallet that we might at some point find some wild plants to be so bitter or of a taste that is simply unpalatable? what would you recommend to try on your first forays into the world of foraged foods as a soft way in? I think also a lot of the salad leaves we can buy these days are pretty bland. Brilliant ,thank you, time to gets the books out to the tracks I think, have a look what’s about.